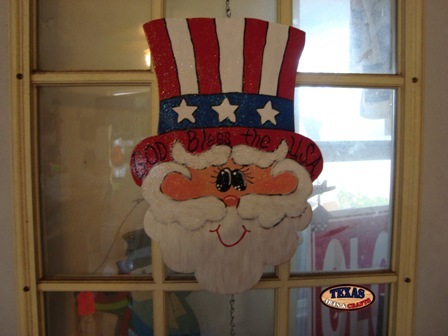 We make the God Bless the USA Uncle Sam yard sign in our workshop. Uncle Sam is hand painted red, white, and blue. Uncle Sam is holding an American flag. On Uncle Sam's hat it reads God Bless the USA. The dimensions for the item are approximately 33 inches tall by 20.50 inches wide by 1.50 inches deep. The arts and crafts sign has a 33 inch stake. The yard sign weighs approximately 5.25 pounds with packaging. For the continental U.S. shipping and handling is included in the listed price. For shipping outside the continental U.S. please contact us through our Contact Us page. 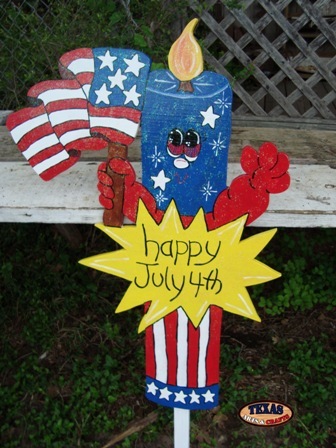 We make the Happy July 4th Firecracker yard sign in our workshop. 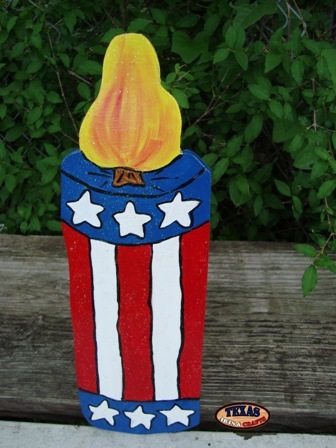 The firecracker is hand painted red, white, and blue. The sign reads Happy July 4th. The dimensions for the yard sign are approximately 32 inches tall by 22 inches wide by 1.50 inches deep. The arts and crafts sign has a 31 inch stake. The sign weighs approximately 4.75 pounds with packaging. For the continental U.S. shipping and handling is included in the listed price. For shipping outside the continental U.S. please contact us through our Contact Us page. 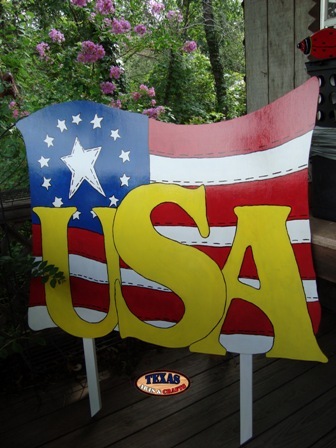 We make the USA Flag yard sign in our workshop. The USA Flag is hand painted red, white, and blue with yellow letters reading USA. The dimensions for the yard sign are approximately 37 inches tall by 44 inches wide by 1.50 inches deep. The arts and crafts sign has two 36 inch stakes. The sign is a local item only, and should be picked up from our shop. We make the 4th of July yard sign set in our workshop. 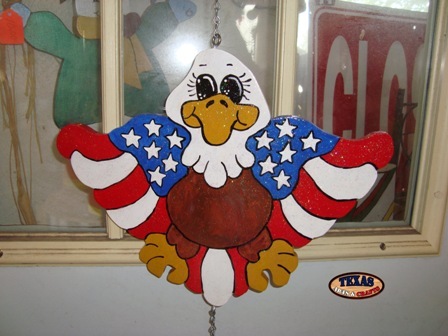 The Eagle, Star, and Firecracker are hand painted red, white, and blue. The dimensions for the eagle yard sign are approximately 11 inches tall by 14 inches wide by 1.50 inches deep. The arts and crafts sign has a 13 inch stake. The sign weighs approximately 2 pounds with packaging. The dimensions for the firecracker yard sign are approximately 13 inches tall by 4 inches wide by 1.50 inches deep. The arts and crafts sign has a 13 inch stake. The sign weighs approximately 1.75 pounds with packaging. The dimensions for the star yard sign are approximately 11.75 inches tall by 11.50 inches wide by 1.50 inches deep. The arts and crafts sign has a 13 inch stake. The sign weighs approximately 1.75 pounds with packaging. The combined dimensions are 13 inches tall by 14 inches wide by 1.50 inches deep. The combined weight with packaging is 5.50 pounds. For the continental U.S. shipping and handling is included in the listed price. For shipping outside the continental U.S. please contact us through our Contact Us page. 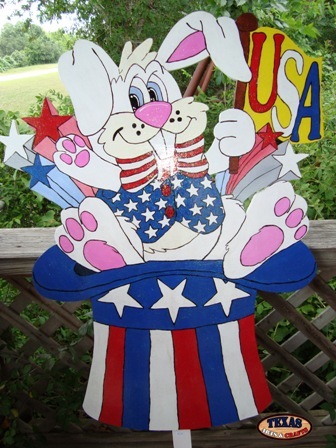 We make the Rabbit Hat USA yard sign in our workshop. The rabbit is hand painted white with a red, white, and blue vest. The rabbit is on top of a red, white, and blue hat. There are red, white, and blue stars. The rabbit is holding a flag that read USA. The dimensions for the yard sign are approximately 40 inches tall by 30 inches wide by 1.50 inches deep. The arts and crafts sign has a 38 inch stake. The sign weighs approximately 10 pounds with packaging. For the continental U.S. shipping and handling is included in the listed price. For shipping outside the continental U.S. please contact us through our Contact Us page. 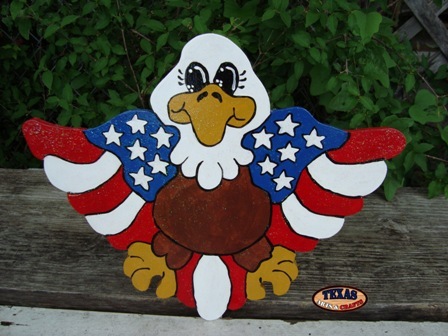 We make the 4th of July Eagle yard sign in our workshop. The eagle is hand painted red, white, and blue. The dimensions for the yard sign are approximately 11 inches tall by 14 inches wide by 1.50 inches deep. The arts and crafts sign has a 13 inch stake. The sign weighs approximately 2 pounds with packaging. For the continental U.S. shipping and handling is included in the listed price. For shipping outside the continental U.S. please contact us through our Contact Us page. 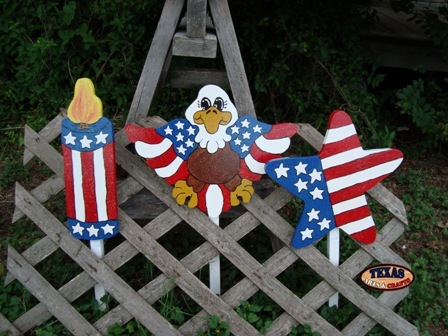 We make the 4th of July Firecracker yard sign in our workshop. The firecracker is hand painted red, white, and blue. The dimensions for the yard sign are approximately 13 inches tall by 4 inches wide by 1.50 inches deep. The arts and crafts sign has a 13 inch stake. The sign weighs approximately 1.75 pounds with packaging. For the continental U.S. shipping and handling is included in the listed price. For shipping outside the continental U.S. please contact us through our Contact Us page. 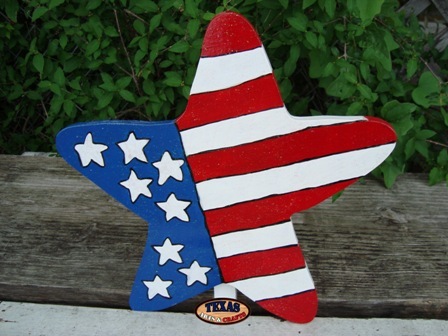 We make the 4th of July Star yard sign in our workshop. The star is hand painted red, white, and blue. The dimensions for the yard sign are approximately 11.75 inches tall by 11.50 inches wide by 1.50 inches deep. The arts and crafts sign has a 13 inch stake. The sign weighs approximately 1.75 pounds with packaging. For the continental U.S. shipping and handling is included in the listed price. For shipping outside the continental U.S. please contact us through our Contact Us page. We make the four piece 4th of July Hanger in our workshop. 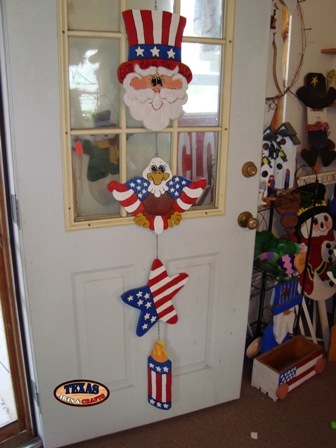 Uncle Sam, eagle, star, and firecracker are hand painted red, white, and blue. The signs are linked together with eye hooks and chains. 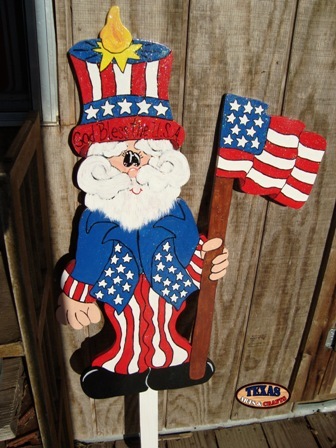 The dimensions for Uncle Sam are approximately 15 inches tall by 10.75 inches wide by .50 inches deep. The sign weighs approximately 2.25 pounds with packaging. The dimensions for eagle are approximately 10.50 inches tall by 13.50 inches wide by .50 inches deep. The sign weighs approximately 1.75 pounds with packaging. The dimensions for star are approximately 12 inches tall by 11.50 inches wide by .50 inches deep. The sign weighs approximately 1.75 pounds with packaging. 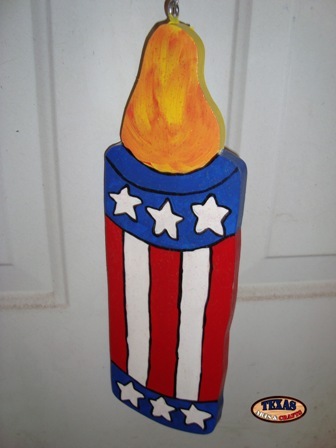 The dimensions for firecracker are approximately 13 inches tall by 4 inches wide by .50 inches deep. The sign weighs approximately 1.50 pounds with packaging. The combined dimensions with packaging are 15 inches tall by 13.50 inches wide by 3 inches deep. The combined weight with packaging is 7.25 pounds. For the continental U.S. shipping and handling is included in the listed price. For shipping outside the continental U.S. please contact us through our Contact Us page. 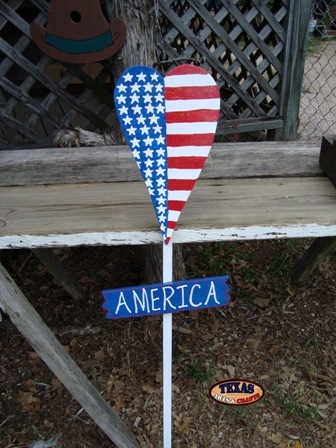 We make the America Heart yard sign in our workshop. The heart is hand painted red, white, and blue. The sign reads America. The dimensions for the yard sign are approximately 15 inches tall by 8 inches wide by 1.50 inches deep. The America sign is 3 inches tall by 12 inches wide. The arts and crafts sign has a 36 inch stake. The sign weighs approximately 2.25 pounds with packaging. For the continental U.S. shipping and handling is included in the listed price. For shipping outside the continental U.S. please contact us through our Contact Us page. 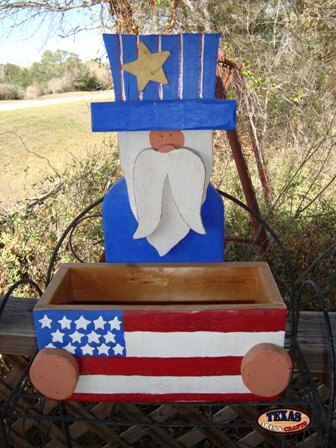 We make the Uncle Sam Planter out of cedar in our workshop. 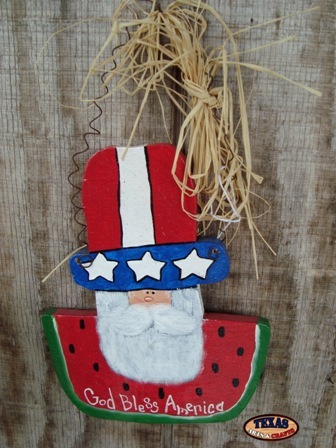 A red, white, and blue Uncle Sam is hand painted onto the planter. The dimensions for the planter are approximately 21 inches tall by 14 inches wide by 8.75 inches deep. The planter weighs approximately 6.50 pounds with packaging. For the continental U.S. shipping and handling is included in the listed price. For shipping outside the continental U.S. please contact us through our Contact Us page. 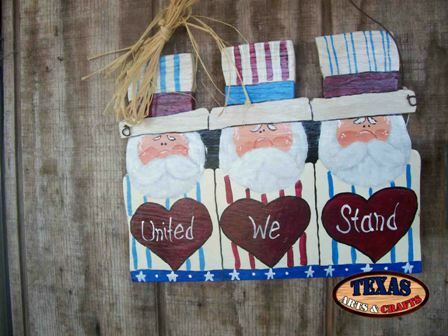 We make the United We Stand sign in our workshop. Three Uncle Sam's are painted onto the sign. The sign reads United We Stand. The dimensions for the sign are approximately 10.50 inches tall by 13 inches wide by .50 inches deep. The sign weighs approximately 1.50 pounds with packaging. For the continental U.S. shipping and handling is included in the listed price. For shipping outside the continental U.S. please contact us through our Contact Us page. We make the Blue Star yard sign in our workshop. 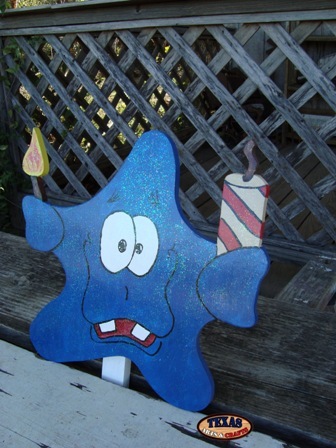 The star is hand painted blue with a red and white firework and a lighted match. The dimensions for the sign are approximately 14 inches tall by 14.50 inches wide by .75 inches deep. The yard sign has a 14 inch peg. The sign weighs approximately 2.25 pounds with packaging. For the continental U.S. shipping and handling is included in the listed price. For shipping outside the continental U.S. please contact us through our Contact Us page. 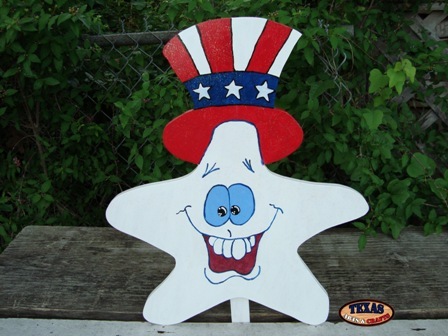 We make the White Star yard sign in our workshop. 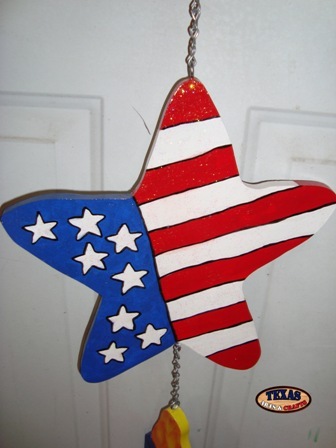 The star is hand painted white with a red, white, and blue hat. The dimensions for the yard sign are approximately 19 inches tall by 15.50 inches wide by 1.50 inches deep. The arts and crafts sign has a 16 inch stake. The sign weighs approximately 2.50 pounds with packaging. For the continental U.S. shipping and handling is included in the listed price. For shipping outside the continental U.S. please contact us through our Contact Us page. 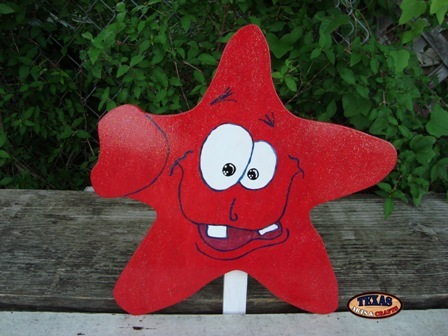 We make the Red Star yard sign in our his workshop. The star is hand painted red. We make the God Bless America sign in our workshop. Uncle Sam is hand painted red, white, and blue. The watermelon is painted red and green with black seeds. The dimensions for the sign are approximately 10 inches tall by 8 inches wide by .50 inches deep. The sign is on a wire hanger which makes the total height 13 inches. The sign weighs approximately 1.75 pounds with packaging. For the continental U.S. shipping and handling is included in the listed price. For shipping outside the continental U.S. please contact us through our Contact Us page. 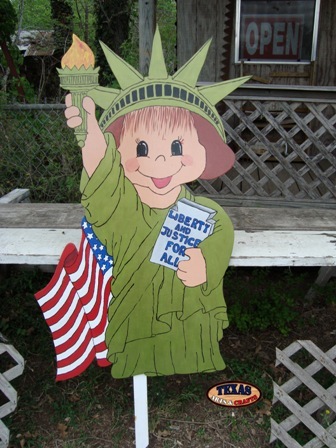 We make the Lady Liberty Sign in our workshop. Lady Liberty is hand painted green with the red, white, and blue United States Flag. She is holding a blue tablet that reads Liberty And Justice For All. The dimensions for the sign are approximately 47 inches tall by 24.50 inches wide by 1.50 inches deep. The sign has a 32 inch stake. The sign is a local item only, and should be picked up from our shop. 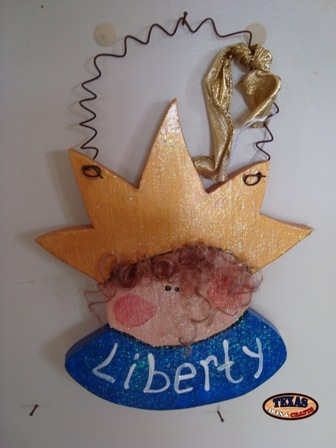 We make the Liberty Girl hanging sign in our workshop. The sign is hand painted blue and yellow. The sign reads Liberty. The dimensions for the sign are approximately 9.75 inches tall (with wire hanger) by 6.50 inches wide by .50 inches deep. The sign weighs approximately 1.50 pounds with packaging. For the continental U.S. shipping and handling is included in the listed price. For shipping outside the continental U.S. please contact us through our Contact Us page.